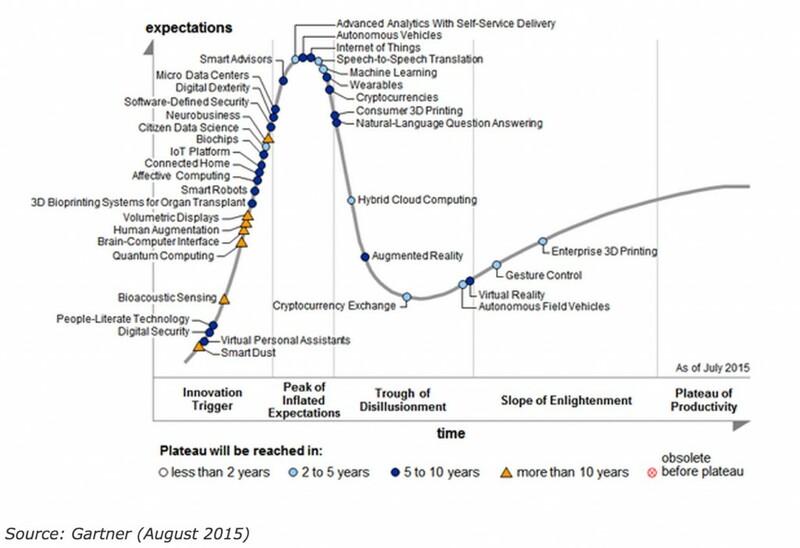 Gartner, Inc. has developed a useful tool in the graphical representation of the maturity and adoption of technology and its applications known as the Hype Cycle. For example, here is an interesting hype cycle that the company put out in August of 2015 that is a snapshot of notable technologies and products at that time. The hype cycle can also be used to track the history of a specific technology over time. I find hype cycles fascinating. While they are subjective in nature, they are also helpful in explaining the interaction between ideas and the public. I also think introducing concepts from one discipline to another is a fascinating exercise. While history has shown this to result in some terrible outcomes (introducing natural selection into social science supported Nazism and Planned Parenthood for example), it has lead to many more useful insights (Toyota’s lean manufacturing being used in software development and company start-ups). 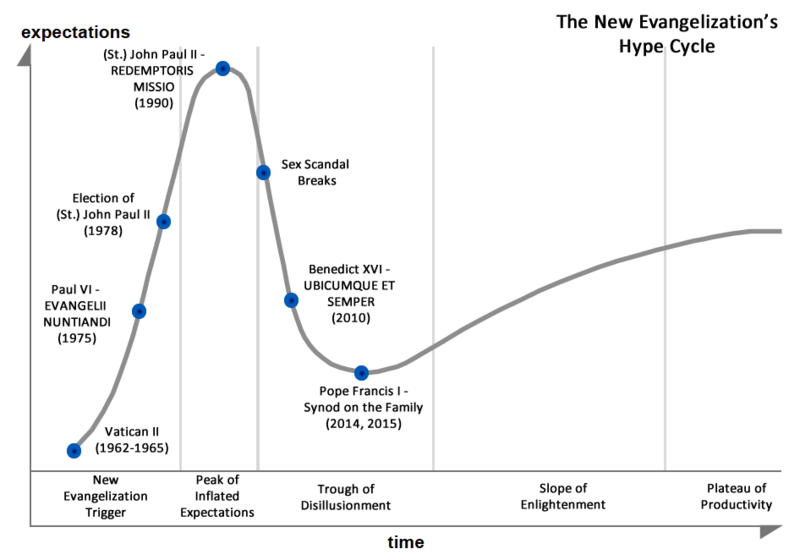 So I began to wonder if the concept of the hype curve could be used on some trends in the Church. After giving it some thought, I do believe that the hype curve can be very useful in analyzing some of what we are witnessing today. Just as a quick example, I threw together what I see as the Hype Cycle for something that is very much needed today – evangelization. Below is a very sparse hype cycle for the New Evangelization. Some may see my hype cycle as being negative and critical of the current events of the Church. But I would argue that my hype cycle could be seen as having a hopeful point-of-view, placing us at the point just before substantial and sustained growth in evangelization along the slope of enlightenment and onto the plateau of productivity. New Evangelization Trigger A new emphasis on an old truth kicks things off. Early energy and interest trigger significant publicity within the Church. Often no usable structures, organizations, materials, etc. exist, and viability is unproven. Peak of Inflated Expectations Establishment of many new organizations and resources that equip and assist the faithful in evangelization. Though there is a new interest in the faith by many, the desired influx of converts is not realized on a large scale. Trough of Disillusionment Interest and excitement wanes as efforts fail to deliver the hoped for results. Interest continues only if the surviving organizations improve and update their products, methods, and messages. Organizations directly tied to efforts in the New Evangelization shake out or fail. Calls to abandoned the effort and change direction begin to be heard. Slope of Enlightenment More instances of how the New Evangelization can benefit the world start to crystallize and become more widely understood. Second- and third-generation efforts and products appear. The faithful invest resources into the evangelization effort on their behalf and on the behalf of others. Plateau of Productivity Mainstream adoption begins to take off, and a growing number of people enter faithfully into the Church. The New Evangelization efforts have clearly paid off.